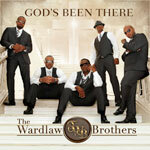 God's Been There is TWB's new project produced by Grammy Award winning producer Cedric Thompson, Dove Award winning producer Antonio Neal and Martin Luther Wardlaw. "Somewhere Listening", derived from an old spiritual song, is the project's first single. Showcasing their versatility, TWB offer a traditional, high-energy gospel quartet track "Right Now Lord" and a special tribute to the military "Welcome Home Soldier" which has become a Youtube video hit.